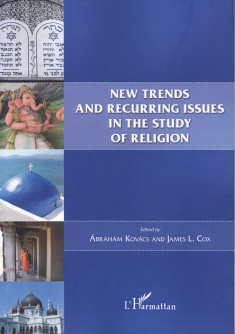 Book edited by Ábrahám Kovács and James L. Cox. L'Harmattan Publishing House, Budapest, 2014. The articles in this book contain keynote addresses that were presented at the 10th Conference of the Europian Assosiation for the Study of Religions held from 18 to 22 September 2011 in Budapest, which was hosted by the Hungarian Association for Study of Religions. In addition, two further articles written by the editors of this volume have benn included. This book is divided into three sections according to the themes of the papers. The first section provides an overview of the field written from sociological and historical perspectives. The history provided focuses on the academic study of religion in relation to Eastern Europe, with an emphasis on two seminal Hungarian scholars. A second section deals with current issues in and new approaches to the study of religion as presented by four academics from Finland, Scotland and Hungary. The final part of the book addresses philosophical issues in the study of religion, largerly by presenting a phenomenology of Christian belief and practice.